Tempest stabbed at her food at breakfast and she herself took notice as everyone around her watched her as she stuffed the food in her mouth angrily. She broke Voids’ wrist when he grabbed her hands to try and calm her. "Now is not a good time to try and calm me." "Fine, Chad, maybe we should go. The girls might have a better luck with her than us." "Okay." They left and Tempest clutched her forehead. "See Nila, you can already tell by the way that she is acting that was cute." "I can’t believe this," muttered Tempest under her breath. "Yeah, I guess you’re right, she does have great taste in guys after all. Look at Draco for example." "Can you two please shut up before I jinx your mouths shut." "Fine, we’ll shut it, but please tell us, was he cute or not," asked Nila. "He was cute," she finally said smiling. "What color eyes and hair?" asked Nila. "Sandy brown hair and blue-grey eyes, can we please change the subject now?" "All right, fine. Anyway have you told your mum yet?" "I wrote to her first thing this morning. I should be getting a reply anytime soon." "Hopefully, I mean what’s so special about it anyway," remarked Nila. Tempest shrugged and finished the last of her food. They all walked grumpily to their first class of the year. Astronomy. Tempest stood at the rear of her class as Mistress Starlet spoke. "I must say, it is most delightful to have MOST of you back in my class," she said eyeing Tempest and her friends. "Now I want all of you to turn to page 361 and start reading. At the end of class I will ask a series of questions, so I will expect you to know the answers." Tempest sat down against her favorite tree and opened her book. Nila opened her and sat bored already. "Yes Nila, why don’t you try and read, that is if you know how to anyway," snickered Void. Nila slanted her eyes and threw her book at Void who caught it easily. She rolled her eyes. "I hate you," she said smiling. "I know you do," he said throwing the book back to her. Tempest smiled and continued reading. Divina looked at her then at the forest. "Zephyr, remember that dark magic users can't enter the forest?" "You can go in now without getting hurt." "Yeah I . . . " she stopped second in thought. "Oh no, Divina you got her onto something," joked Chad. "Funny Chad. Anyway I’m a descendant of Merlin right?" They nodded. "Morgan Le Fey turned to darkness right?" They nodded again. "Her son Mordred must have carried on the blood, but remember Excaliber?" "Merlin gave it back to the Lady of the Lake who is in essence the queen and master of all good magic." "So you think that Excaliber is your sword?’ asked Void. "How the bloody hell did you get all that from me saying what I said," exclaimed Divina. "I just did now hush I’m not done. Anyway now I have a question for you. Who taught Morgan how to use the dark magic and who regained Excaliber?" They all looked at each other and Tempest her trademark smiled which in return. "We’re going to be spending all out time in the library again aren’t we," whined Nila. Tempest tapped her quill on her parchment and waited for her dragon to return. Her friends watched and urged her to calm down. She glared at them with much hostility. "I can’t calm down. That sword is mine and belongs to me and me alone." "Possessive aren’t you," commented Nila. "Oh you have no idea, " said Void. She watched them flinch and quiet down. She slammed her book shut and began pacing. She stopped against the common room wall and kicked the wall. She looked at her friends. "What? I can’t kick a wall?" "Just calm down," said Chad. He walked over to her and grabbed her by her shoulders. She stared at him, then quickly looked away. "Uh, come one guys. Zephyr tell us what your mother wrote okay?" "Yeah Nila. See you later. They left and tempest sighed when Chad pulled her close to him and held her. "I’m trying, it’s just, I don’t know. Once something is mine I like to keep it that way. Its difficult to understand." She smiled and looked up at him. Suddenly her dragon landed on her head and dropped a parcel into her hand. She sat on the ground and began to open it. "How do you keep your dragon to small?" "A spell of course. I can reverse it anytime I want to. But if I did, we would probably die." He laughed and she opened the package. It was filled with a bunch of books and a note. She looked at Chad and he looked back. "You start looking at the books and I’ll read what my mum wrote." He nodded. Tempest opened the letter and began to read. Why me, she thought. Apparently she was related to Arthur and he himself was a student of Merlin. 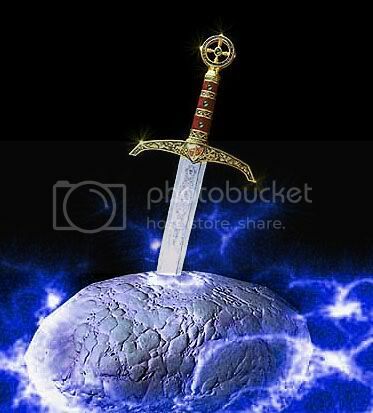 The sword itself was create by the Lady of the Lake to be given to someone pure of heart and only someone of his bloodline could unleash its power. He has to be related to me some way then, she thought. "Gross," she exclaimed remember that she had thought he was cute earlier. "Huh, or sorry I just remember a disturbing thought." "I could see that. Anyway what did your mother say?" "My sword is Excaliber, and only my bloodline can unleash the swords power and that I have to read ever single one of these books that she sent and will going to send me." "Bloody hell, this is already ten book. How many more books is she going to send you? Wow you have a lot of fuure reading to do." "That’s why I have you people to help me," she said picking up a book.